Thank you Winona & Beyond! Families were able to walk the Pay It Forward Honor Path and find the name(s) of their loved ones who were honored and remembered for their fight with cancer. The day featured some feisty winds, but the morning sun made the path a time for warm reflections. Thank you to Paul and Laura Schaffner for sharing their creative talents and ability to engineer some great challenges for the kids. And thank you to our Winona State trackster volunteers for the helping hands with all that activity! Our Kids Bakers showed skill far beyond their years! Cutest Cupcake Winner: raised $400 for Team Vogel! Winona's Pros proved we have the best cupcakes in the country! The Amateur Adult division talents rounded out the competition in a fabulous way. Mike & Mike: stylish champions again! 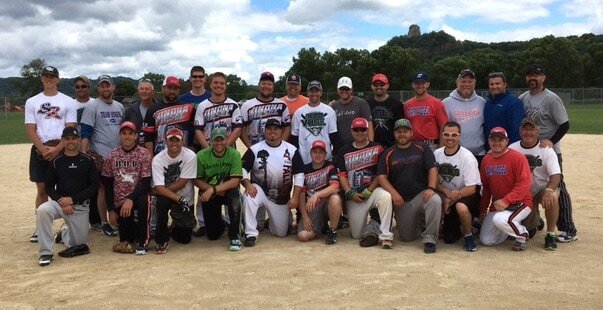 Men's Softball Tournament: All are winners! It was a weekend of some challenging weather moments, a home run derby that became a raffle, and plenty of excitement on the diamonds for teams and fans. Once again the top placing teams (1st-4th) contributed their winnings back to Team Vogel. Thank you all for Paying It Forward in 2017.